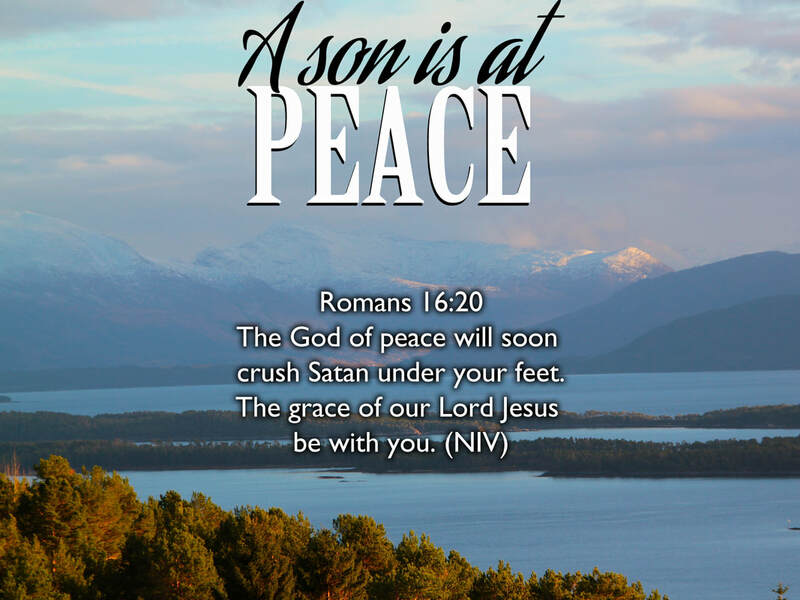 I find it interesting in this week's Scripture passage that Paul writes that the God of Peace that will soon crush Satan under our feet... not the God of War. In the context of seeing our enemies destroyed, you would think that Paul would use a more 'battle-like' description of God, maybe 'The Lord of Hosts' but he doesn't. He says it is the God of Peace that will do the crushing! If we can fully grasp this reality, it will change the way we see spiritual warfare in our lives. It isn't our ability to shout louder than the accuser that brings about his demise, but the peace that passes understanding (Philippians 4:7) that comes from God. It isn't our ability to get worked up in a tizzy that will bring our adversary's downfall, but our ability to be at peace in the midst of every storm that life throws at us. If we look at how the demonic realm reacted to Jesus' presence, we will see conquering peace in action. All He had to do was show up on the scene and the demons went nuts and were scared out of their minds... without Him saying a word! I truly believe that when we begin to understand that the battle really is The Lord's (1 Samuel 17:47), we will stop feeling that we have to fight for ourselves. When we truly begin to be convinced that God is for us (Romans 8:31), we can take a deep breath, relax and simply live with a deep sense of peace in the very core of our being. The truth is that the battle has already been won! When Jesus said the words... 'It is finished' on the cross (John 19:30), He secured our victory forever. I believe it is the peace that passes understanding (Philippians 4:7) that will truly guard our mind and our heart. And it is this same peace that will give us the courage to cease from our own works and enter into God's Sabbath rest with Him (Hebrews 4:9-11). Our good friend, Jack Frost used to say... When we strive, God waits. When we rest, God acts. We see this statement in action in Exodus 14:14 when God says to Israel ...The Lord himself will fight for you. Just stay calm.” (NLT) The NIV Bible says... The Lord will fight for you; you need only to be still. (NIV) I find it interesting that when we fight for ourselves, He waits. When we wait on Him to do the fighting, He gladly gets in the fray on our behalf. And Paul paints a clearer picture of Papa's heart for us when he writes in Romans 8:31... What shall we say about such wonderful things as these? If God is for us, who can ever be against us? (NLT) The more that we know this to be true, the less we will feel the need to strive or fight for something that is already ours in Christ. The life-changing revelation that God loves us and is for us in every way, is guaranteed to lead us into a profound peace and a rest in our soul (Matthew 11:28-30). This is a place where we will be convinced beyond a shadow of a doubt that nothing in all creation can ever separate us from His love in Christ (Romans 8:35-39). That doesn't mean there won't be hardships that come our way, because Jesus did say that in the world, we would experience trouble. But the good news is that we can rejoice because Jesus has overcome the world! My prayer today is that you would experience God's peace at all times and in every way (2 Thessalonians 3:16) in your life. May you be so rooted and grounded in God's love for you (Ephesians 3:14-21) that nothing will ever be able to steal your peace from you because it is part of your birthright as a believer (Romans 14:17). And since it is part of your eternal inheritance package, you might as well start enjoying the benefits of it this side of heaven! The truth is that the Godhead imparted peace into your spirit the moment you were born again. You don't need to try to muster it up in your own strength because it is already yours in Christ. The work of God is simply to believe that it's true (John 6:29), 'Be still and know that God is really God (Psalm 46:10) and yield to the Kingdom of Peace that resides in your heart right now (Luke 17:20-21).